When you’re hitting the trails for some hiking, you want to be comfortable. And part of that comfort is having the best daypack to keep you going strong! Here’s a review of some of the things that makes this backpack a quality hiking backpack! This daypack is designed to fit so the weight of the backpack is distributed in a way that makes it the most efficient to carry. Like a normal backpack, you have the waist straps to adjust, but this hiking backpack also has straps up top on the shoulders. This makes it so you can adjust the weight of the backpack that way too. Using the shoulder straps, you can lift the backpack up a little higher, or put it back down a little lower, depending on how you feel. 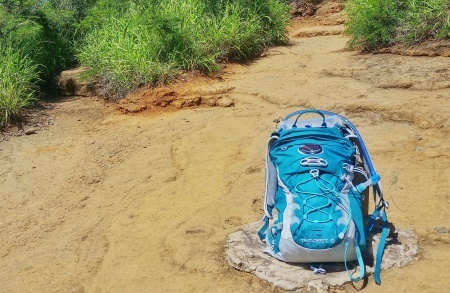 Shifting the weight of your backpack regularly when you’re hiking can be helpful especially if you have a heavier load. The back of this backpack is made of a mesh panel to help minimize the sweating on your back. You’ll still sweat if it’s hot of course, but the backpack just won’t be planted against your back to further the sweating! If you decide to use trekking poles, this backpack has a spot to hang those poles too when you’re not using them. You can also run with this backpack without feeling it bounce around on your back! Once again, this goes back to the design that makes it efficient to carry loads while on-the-go. There are lots of little pockets everywhere with this backpack, so it can make it easy to access the small things you carry with you. There are (mesh!) pockets at the waist that can fit a smaller phone. If you have an older smaller iphone, it should be a perfect fit to carry your phone while hiking in a convenient way right at your waist. A Samsung Galaxy S5 fits too, but it just doesn’t look as natural. There’s the front pocket up top, that has a hook on the inside too, so you can hook a compass + thermometer + whistle key chain like this one to it. And with the bungee straps on the front side, you can use that space to carry your ultralight first aid kit or a lightweight jacket. Not a pocket, but there’s a clasp on the front too, that you can attach a bike helmet to if you use this backpack to commute around town! This can make it a perfect backpack for bike commuters! 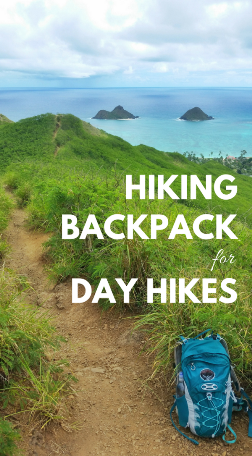 If you’ll be going on hikes that are a couple hours long, this can be the perfect size backpack (and hydration pack!) to bring along. The backpack in the pictures on this page is 9 liters, which will look small when you first take a look at it. When you open up the backpack and take a look inside you may even think there’s no space at all because you’re not used to such a small pack. But you really don’t need that much space when you’re planning for a hike that’s a couple hours long, so it allows you to carry just what you need for a hike! In fact, out of the negative reviews for this backpack, the size seems to be the biggest issue. Just take a look at this negative review here about that. This backpack is not cheap. But Osprey is one of the leading brands for outdoor backpacks, and you’ll get functionality and durability with this backpack! Check the price for the women’s backpack. And check the price for the men’s backpack. Too small for a hiking backpack? You can go bigger! If you find that the 9 liters for women or 11 liters for men is a bit too small for your liking, there are other sizes of backpacks in the series with similar features. That would be the Osprey Tempest backpacks for women, and the Osprey Talon backpacks for men! You can easily tell the size of the backpack in liters based on the number attached to the end of the name. For example, the backpack shown on this page is the Osprey Tempest 9. 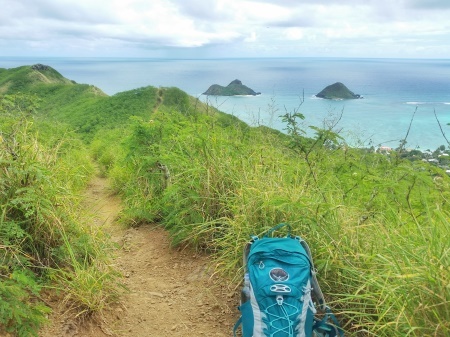 This picture here (on the Lanikai Pillbox Hike in Hawaii!) shows a 20oz SmartWater bottle in the side pocket on the left side. But this size water bottle really tests the elasticity of the pocket, so it wouldn’t be recommended to make it a habit to carry your water like this. Instead, you can put the water bottle in the backpack itself, or this backpack is compatible with a hydration pack like this zip-up 2 liter water pack, pictured below. Hiking with a hydration pack makes it so that you don’t have to go digging through your backpack each time you want to take a sip of water. Instead, the hose is pretty much right there at your chest, so all you do is grab what’s hanging out right in front of you and sip the water! This can be ideal for hiking in hot weather, because it can get you drinking water more often. The hydration pack fits into a specially designed back sleeve of the backpack and fits all the way in. Here below, the water pack is sticking out at the top on the back side of the backpack so you can see where it fits. Similar to how a hiking backpack is designed to be most efficient in how the weight of what you’ve packed is carried, a hydration pack can help to better distribute the weight of the water compared to a bunch of water bottles. 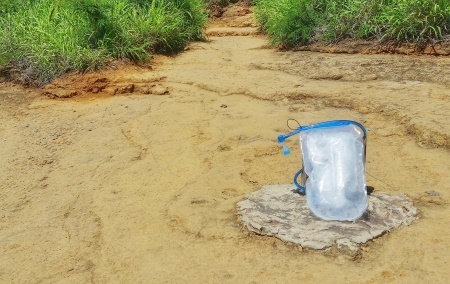 Tip: For a hot weather hike, fill the hydration pack half way with water, then freeze it the night before. Then the morning of your hike, fill the rest of the pack up with water. The key here is to make sure your water isn’t frozen when you need to drink it! So make sure your hydration pack isn’t too full of frozen water. Have a further look at this daypack for hiking! For more about the backpacks in this series, have a look at the video below!